A keen theatre-goer, ‘Teddy’ Longman was mayor of Southend from 1952-53. 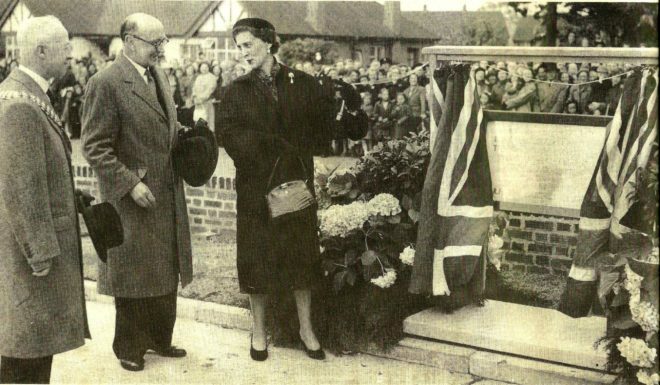 For many years he headed the carnival committee; he is pictured here with Princess Marina, Duchess of Kent, on 17 May 1955, when she unveiled a plaque at the opening of “the old folk’s bungalow estate, for which money was raised by Southend’s famous carnival” (according to the caption to this Echo photograph). On the left is that year’s mayor, Alderman Bride. ‘Teddy’ Longman was awarded the Honorary Freedom of the Borough of Southend-on-Sea in 1968. His term of office as Palace Theatre Club President sadly ended when he died. We would welcome further information about Teddy, who appears to have been quite a character, as a saucy remark, recorded in the ‘History of the Palace Theatre Club’ section, indicates! Born and educated in Manchester, Stella moved to London in 1925, arriving on the day of Queen Alexandra’s funeral (29th November). She moved to Southend in 1944 and, in 1950, was awarded an MBE for ‘secret’ work she carried out in the civil service during the war. She was a founder member of the Palace Theatre Club and an ardent supporter of it, and the Palace Theatre, for the rest of her life. Theatre was in her blood – her great-grandfather had been a barnstormer – and she was a fine actress. She taught drama, wrote poetry, and was President of the Southend Shakespeare Society and an active member of the North Country Association. She travelled the world, and spoke seven languages. When, in 1982, awards were instigated to recognise the best performances by an actor and actress at the Palace, each year, they were named the Stellas, in her honour. 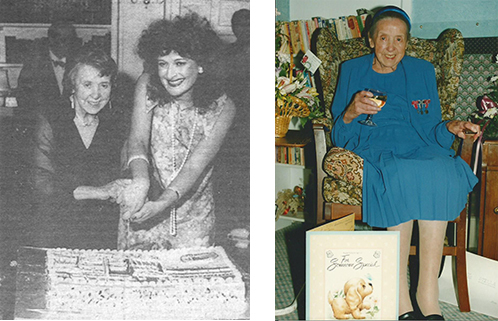 Stella was made Life President of the Palace Theatre Club in 1981. She spent her final years in Uplands Private Nursing Home, Westcliff, where she gave a rousing speech from Shakespeare on the morning of her death, at 100 years of age! Fittingly, her cortege paused for one minute outside the Palace. Her funeral service was held at St. Mark’s, Hamlet Court Road, Westcliff, before the committal at Southend Crematorium. Her wake was held in the Dixon Studio. Margaret Haine presents Robert Demeger with the ‘Stella’ award for best actor for The Merchant of Venice (2000). Outside the Palace Theatre (September 1995). Margaret was born in London in 1920 within the sound of Bow Bells. She was educated at Camden School for Girls and University College London, and began her teaching career at a small grammar school in Kent. She moved to Chatham Grammar School, where she became Head of English, before being appointed Deputy Head at Palmers Girls’ School in Essex. In 1969 she became headmistress at Southend High School for Girls, where she remained until retirement in 1984. Soon after retirement she began her second career, and was elected as a Conservative councillor for Southchurch Ward. In 1994 she was selected as Mayor of Southend. 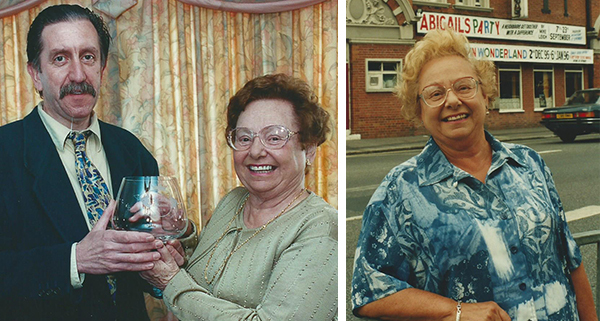 She had many interests and her services to charity were many and various: in all, she raised over £28,000 for a number of charities. Perhaps her greatest achievement was being instrumental in raising the money to build the Margaret Haine Sixth Form Centre at Southend High School for Girls. A great supporter of the Palace Theatre, she was, for a time, a member of the Palace Theatre Trust. We celebrate those who have given, and continue to give, their valuable time to the running of the Palace Theatre Club. It is thanks to their efforts that we are blessed with the healthy and active Club we enjoy today. Thank you to you all! Please note: Club records in the early years are incomplete, and some more recent AGM minutes are missing. So the lists below have been supplemented from Committee meeting minutes, PTC Newsletters and other records. Also, prior to the early 1980s, only those holding the offices of President, Chairman, Secretary and Treasurer were routinely mentioned by name. So we are unable to give full credit to Committee members who held other roles, such as Membership Secretary, before that time. There are also, perhaps inevitably, some question marks and there are bound to be omissions, for which we apologise. We therefore welcome updates, so we can give credit where it is due. Please contact our Archivist, David Simpson, on 01702 464733 or email archivist@palacetheatre.org.uk. Please also note: Where Officers have also served without portfolio, those periods of time are shown separately under “Other Committee”. Current Committee members are shown in bold. This page was added by Ian Grant on 14/05/2014.